I need to say this before anything else: I LOVED THIS BOOK! I cannot believe it took me this long to get to it! Though I think Belly is an awful, AWFUL name for a character (I mean, seriously?? ), I really liked her. She's young, insecure, she makes mistakes and I love her for it. She's had a crush on Conrad for ages and is just confused by him and his actions. One minute it seems like he likes her as well and the next he's cold and she can't tell if he even feels anything. At all. Then there's Jeremiah. He is such a sweetheart! He's the good guy. The one you go to when you're feeling sad and the one you can trust with all your secrets. Besides, he's not badlooking either. I love Jeremiah. Conrad is the mysterious one, dark and moody. And sure, he seems crushworthy. But my heart belongs to Jeremiah. I have a thing for nice guys. Nice guys shouldn't finish last! At the summer house, there's not much room for dads, Belly's parents are divorced and Susannah (Conrad and Jeremiah's mother) just spends most of the summer without her husband. He comes by some weekend, but doesn't really fit in there. Belly's mother and Susannah have been best friends since childhood and I loved their relationship. They both seem more complete when they're together and balance each other out. Susannah is more warm, while Belly's mom is practical. While Belly obsesses about boys, there's another thing happening in the summer house, something that will change all of their lives and summers forever. I won't tell you what it is, but it's heartbreaking. I read this book while sitting in my parents' backyard on a sunny, blue-skyed day. It was perfect. 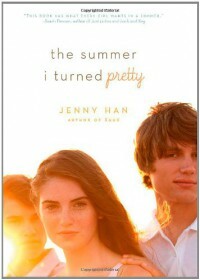 This is the perfect summer read. Bring it with you to the beach or wherever. It sucked me in and brought me back to the summers I was a teenager myself. I love the summer, there's this feeling full of potential, like anything can happen when the sun is shining. This book made me feel that and I absolutely LOVED it!